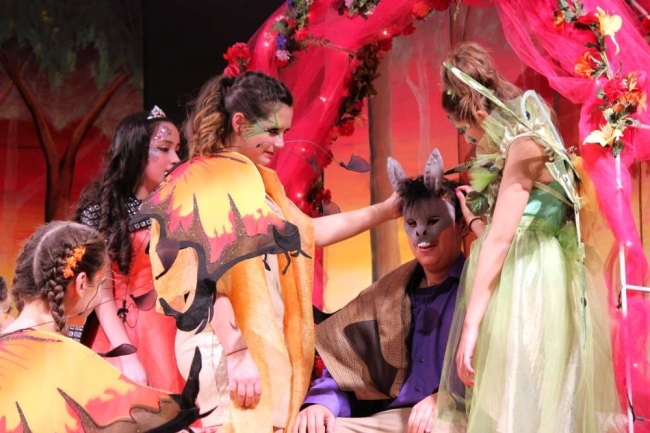 As four high school friends gather to cram for a midterm on Shakespeare’s A Midsummer Night’s Dream, the play comes to life before their eyes... literally! The story unfolds before the teens, as Lysander and Demetrius compete for Hermia’s attention and Helena attempts to capture Demetrius’s attention. When the faeries and Bottom and his players show up, the students work even harder to understand this delightfully convoluted story. Their insightful comments on Shakespeare’s language, his characterization of women and men and even his relevance to today’s world add even more fun. The original Shakespearean language is retained but condensed for this play within a play, with the students interpreting the more difficult passages. Read more...All the plot, all the wit, and all the magic of one of the Bard’s most popular plays is presented here along with lighthearted commentary! Finally, a Shakespeare play that everyone can understand and enjoy! This collection of scenes is intended to give the student or newcomer to Shakespeare a chance to explore some of the well-known younger characters in his plays. Critical principles such as scansion, phrasing, caesura, breathing, antithesis, structure and rhythm are covered in detail.